When I was pregnant I knew it all. I vowed I would have children who would eat eat everything, love every fruit and vegetable and snack on raw broccoli and tomatoes. And suddenly I didn't know everything anymore. If you've been following The Kitchen for any length of time you know I am passionate about feeding my kids with real, whole foods... but that does not mean that my kids always love to eat everything. For Duke's first year of life, I made most of his food from scratch and he would eat just about anything. However, that slowly began to change as he got older and discovered food outside of pureed veggies. He has always been a big eater and it is hard to keep his little belly full. Yet his ferocious appetite combined with a very selective pallet (aka: pickiness) has presented itself with all sorts of challenges in the kitchen and quickly threw some of my "ideals" out the window. All mama's know that when you have a hungry, cranky child... you will do whatever it takes to feed them. Now! And you also know that if you try to force a child to eat something they don't like, you will lose. Every time. Duke's response to something he doesn't like? "Mom, this is NOT delicious." These past few years have been a challenge for me to find creative ways to feed my children with nutritious meals and snacks they will actually eat and that fuel their growing, active bodies with good stuff. With an active 3 1/2 year old and a wanting to walk so badly 1 year old, we are a big fan of snacks at our house. Call it low blood sugar or just being a boy but Duke eats every two-three hours or so. The "Mom! I'm STARVING!" is usually my cue it's time for another snack. With my own kids as the inspiration, I'm going to start a little mini series and pop in from time to time with some snack ideas and recipes for both kids and grown ups alike. Some super quick and simple and some you can make in large batches and keep in the freezer. Today's recipe is one of our favorites and a staple in our freezer. 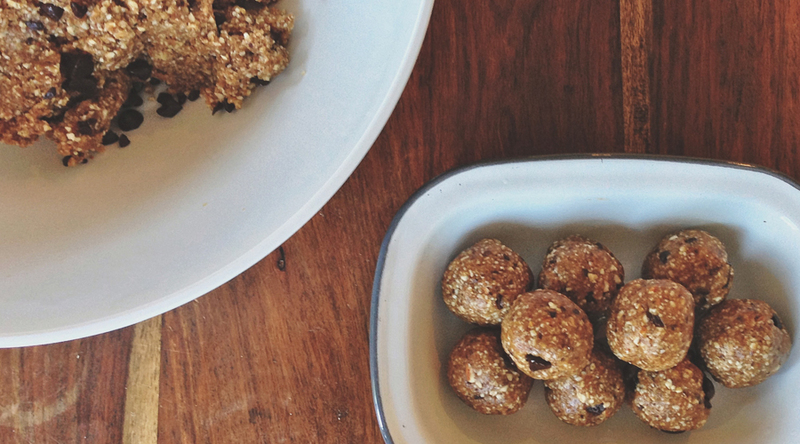 They are similar to LaraBars in their ingredients but we think they taste a whole lot better. Duke thinks they are cookies and I eat them for dessert. Win. Win. 1. Start small. If you find a smoothie recipe you can hide some spinach in, celebrate! Most children won't love kale salad and raw veggies overnight. 2. Make it fun. Kid's love to learn and the kitchen is a great place to teach. If they are involved in the process of making something, often times they are more likely to want to try what they have created. Don't be afraid to get a little silly and excited about explaining why different foods are good for them. We call them "go" foods and "slow" foods at our house. Go foods fuel your body and give you energy to play and learn. Slow foods slow you down a bit and hard for your body to digest. 3. Don't give up. Don't be discouraged if you make something and your kids don't like it. Have a good laugh (or cry) and try something new tomorrow. Eventually you will find a handful of things they like and you can stick to those and keep it simple for a while. We have the privilege and responsibility to steward our children's bodies emotionally, spiritually and physically until they grow up. I want to give them a good foundation and I know you do too! PS: I'd love to hear about your favorite snacks... kid friendly or not! Are there any favorites you would like a healthier version of? I'd love to hear what works and what doesn't in your house. Join me on Instagram (@emosser) and tag your food photos with #hespeaksthekitchen or leave a comment if you want to share your favorites! *I suggest using a food processor to make these. A blender does work but can be a bit tricky to blend the dates. Coarsely chop the dark chocolate chips with a knife or food processor and set aside. Combine almonds, cashews and sea salt in a food processor and grind until it turns into a course powder. Pour it into a bowl and set aside. Combine dates, peanut butter and vanilla in a food processor until it becomes a thick paste. Add the nut mixture to the date mixture and blend until combined. It should be pretty crumbly at this point and that's ok. You will mix it more in a bit. Once dough is combined, take about a tablespoon at a time and roll into a ball. Depending on how big you make them, you should be able to make 18-20. Store them in the fridge or freezer. I make a big batch like this and we keep them in the freezer. You can always half the recipe if you are making them for the first time or don't know how many will get eaten. 1. Coarsely chop the dark chocolate chips with a knife or food processor and set aside. 2. Combine almonds, cashews and sea salt in a food processor and grind until it turns into a course powder. Pour it into a bowl and set aside. 3. Combine dates, peanut butter and vanilla in a food processor until it becomes a thick paste. 4. Add the nut mixture to the date mixture and blend until combined. It should be pretty crumbly at this point and that's ok. You will mix it more in a bit. 6. Once dough is combined, take about a tablespoon at a time and roll into a ball. Depending on how big you make them, you should be able to make 18-20. Store them in the fridge or freezer. I make a big batch like this and we keep them in the freezer. You can always half the recipe if you are making them for the first time or don't know how many will get eaten.